This baby blanket is warmer than a receiving blanket and not as warm as a fleece or quilted blanket making it perfect for those in-between temperatures. 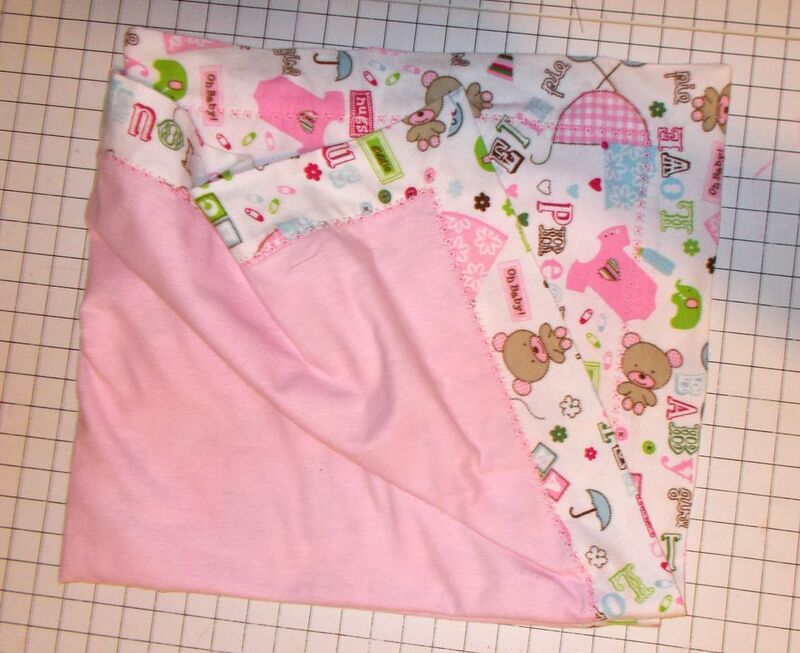 Using two layers of flannel make this a unique weight baby blanket.Other fabrics besides flannel can be used but flannel is being used in this example. Mixing fleece and cotton prints can create an adorable blanket. Decorative thread - optional - a matching thread can be used rather than accenting with a decorative stitch. Measuring tools - Rotary cutting rulers and cutting tools are a great way to assure you are cutting square and straight. Preshrink all fabrics! Flannel fabrics are prone to shrinking so it is important to use warm water and the dryer to shrink the fibers. Squarely cut the 1 1/4 yard piece into a 42" by 45" rectangle (Your rectangle may have to be smaller if your fabric shrank but use as much of the fabric as possible to cut a rectangle of the fabric. Mark the center of each side of both rectangles. Mark 1/2" from each corner. With the wrong sides of the fabric together, match the center marks on the two layers and pin them in place. Pin the sides from the centers to the ends where the 1/2" mark is at the corners. On one side make double straight pins to mark off a 6-8" area that you will not sew so that it will be open to turn the blanket right side out. Sew the sides using a 1/2" seam allowance, stopping at the end corner marks and leaving the area between the double straight pins un-sewn. Using a seam guide will assure accurate seam allowances. Lay the blanket on a flat surface. Even out the edges of the larger fabric so it is even on all sides and flat. Hold the corners up so that you can see where the seam should lay. Press the corners back so that you now have a press line to pin and follow for a seam line. Pin the line to hold the seam in place, removing the pins as you sew..
Sew the corners from the corner to the 1/2" corner mark closing the corners. Trim the seam and press the corner seams open. Turn the blanket right side out through the opening you left in the side seam. Lay the blanket out flat, bringing the edges even on all sides. Press the side seams towards the edges. You will be able to lift the fabric and guide the seam allowance toward the edge as you press. Press the entire blanket flat. Pin or baste in place if desired. Using a decorative stitch, sew with the stitching centered over the seam that joins the two fabrics, joining the layers. Pivot at the corners. If you do not have a decorative stitch available, sew a straight line of stitching on each side of the seam which joins the two fabrics. Use your presser foot as a guide to keep your stitching and even distance and straight. Optional: Add additional decorative stitches if desired.